A Powerful Stream Travels From Level To Level. Use Outside Or Inside. Stuff Points: Earn 219 points when you buy this stuff. Bold lines, and thick stepping sections create a sturdy platform that supports four bowls. A larger bowl is positioned at the base to collect all of the water as it falls, and three others sit on geometric steps to direct the stream in different directions. The thick sections of platform have an interesting shape, and they appear to be chiseled from real stone. The bowls look like they're made from the same material, and the simple, rounded shapes contrast nicely with the severe, straight lines that combine to form the base. Although it looks like it was hand crafted from heavy, natural materials, it's actually made from a durable resin that provides the same look at a fraction of the cost. Once turned on, the powerful pump will send water up to fill the bowl at the top. Once it's full, a large stream will pour out the side to fill the one below it. That bowl will fill as well, and then a spout on it will send water in a different direction, and down to fill the next bowl. Another waterfall will form once water reaches capacity in the last bowl, and it will then fall down to fill the lower basin before it cycles back up to make the same journey again. Natural coloring and a larger size makes this one perfect for garden and patio settings, but it's also safe for indoor use if you choose. Simple Set-Up. Includes all parts, and comes mostly assembled. There are no complicated steps involved, it is completely self-contained, and it plugs into any regular outlet for power. Polyresin Construction. The durable material looks like natural stone or clay, but it's much lighter, and far less costly. Superior Quality. 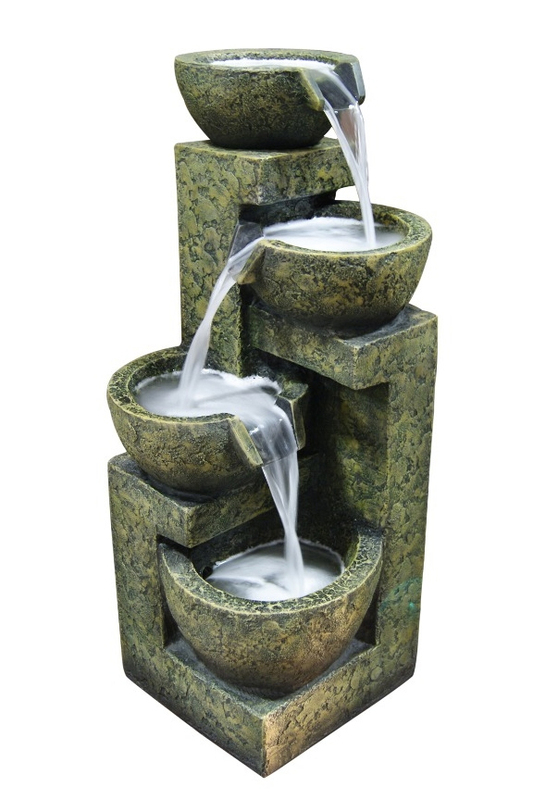 A pleasing design combines with quality craftsmanship to create this elegant looking water feature. Top quality electronics guarantee it will function well, and withstand the test of time. Multiple Tiers. This model has several layers, and three elevated pools to direct water as it cascades down to the bottom. Versatile Placement. Tall, but not too tall, this model works well on a table or the ground. This model is 24 inches tall, and 11 inches wide on it's longest side. At two feet in height, this model is best used on flat surfaces that are lower. It can work well in some table top locations, but the large size may dominate the space with others. Large round bowls are mounted on multiple levels. A strong stream of water pours from one to the next , and travels in a continuous cycle. Order Yours Today!